Quinoa (keen-wah) is a new grain that is very popular these days in my house.We are absolutely enjoying this nutty flavored tiny ancient Peruvian seeds(grain), which is full of protein, fiber, magnesium, iron and what not! Oh, I can’t even remember all the benefits but overall it is a winner of all the grains. 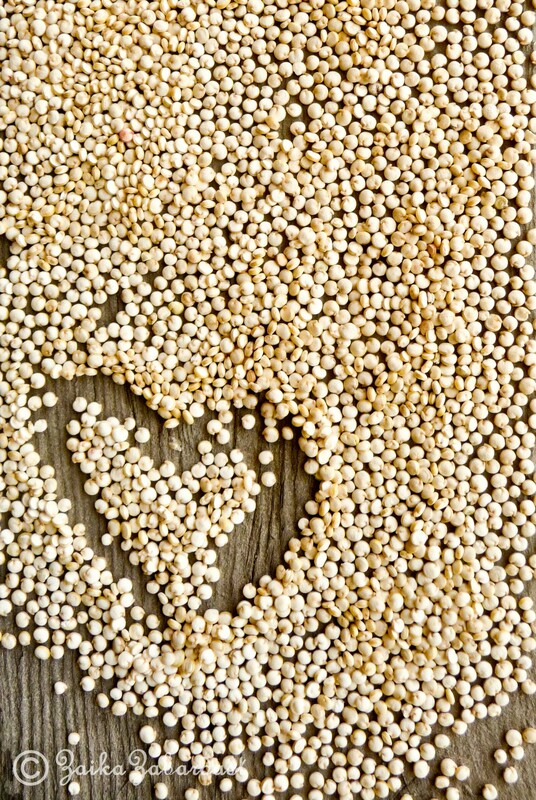 So what is Quinoa and how to cook it? 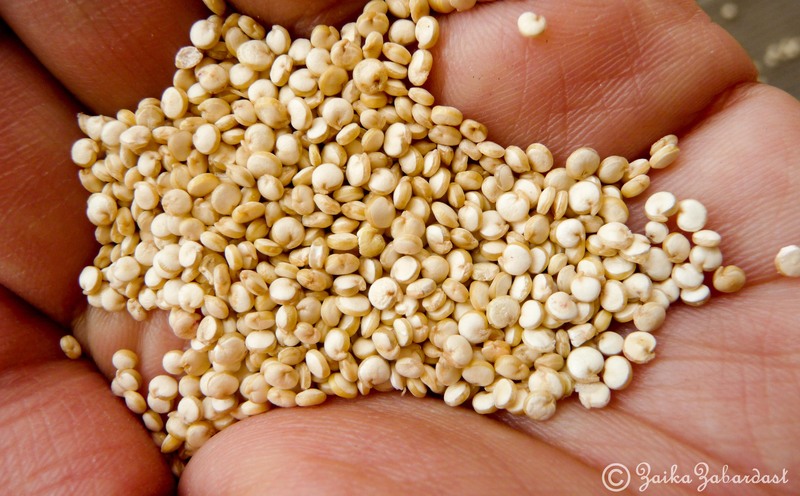 Quinoa (pronounced keh-NO-ah or, sometimes, KEEN-wah) is a relative newcomer to the American pantry. The tiny, ancient Peruvian seed, which has a mild, nutty flavor, is related to leafy green vegetables and is often used like a grain. Quinoa is as versatile as rice but it has a protein content that is superior to that of most grains, because it contains all the essential amino acids. 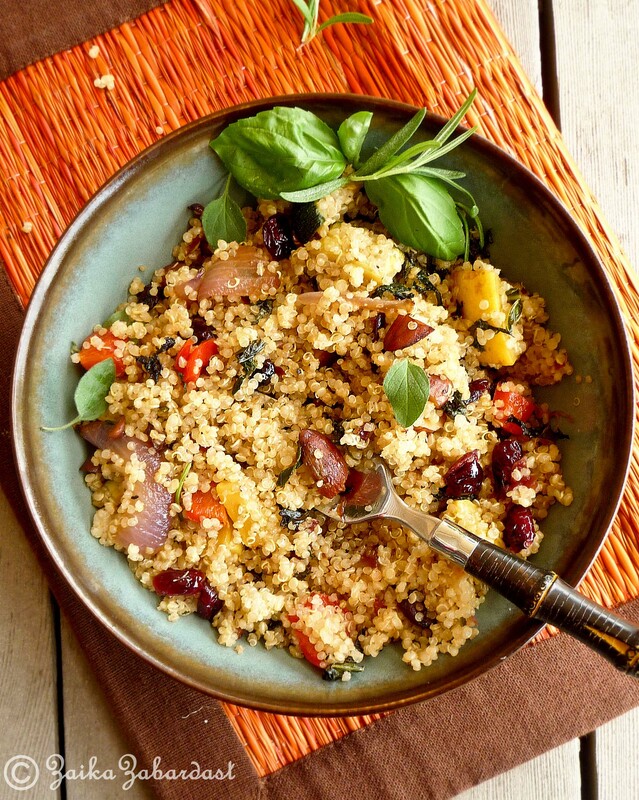 Quinoa is very easy to prepare and it can easily take place of other grains in your palate. First time when I cooked quinoa on the stove top, I made a huge mess. It was lumpy, watery and just not good. We still ate it but not satisfied. So next time I googled and figured out the best and easy way to cook quinoa is in rice cooker. Make sure you take double amount water compared to the quantity of quinoa. Cook in rice cooker the way you cook rice. Rinse quinoa (although if it says it is pre-rinsed, rinse it well), add 1 tsp of olive oil and a pinch of salt to it to add bit of flavor. Once cooked, fluff the cooked quinoa with fork. Leave it aside and use it as desired. 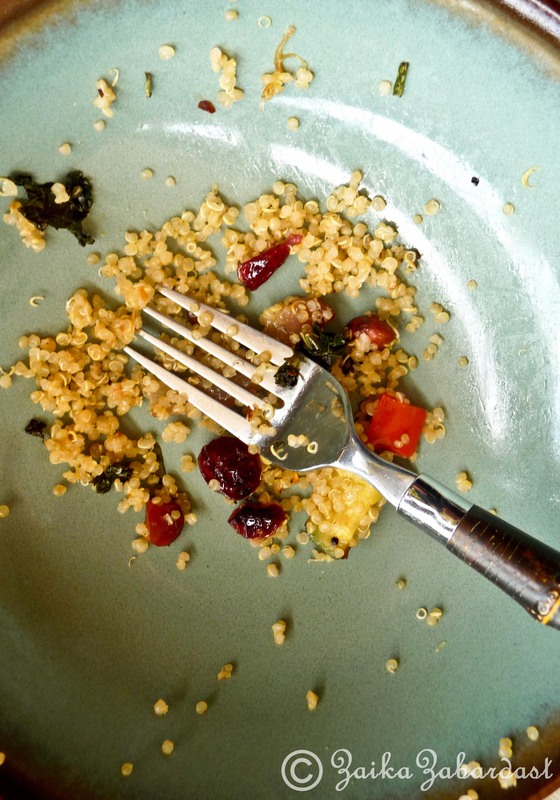 Tip: Make sure that cooked quinoa is not watery when cooked. If it is cook for few more minutes. And you can even cook quinoa with vegetable stock to add more flavors. Here I have made quinoa pilaf salad with lotsss of summer vegetables, kale and some nuts. You can use whatever you have available in your pantry and still enjoy it. Either make it like pilaf or serve stir fried vegetables over the cooked quinoa. Either way it is great. I am sure if you try it, you will enjoy as much we did. 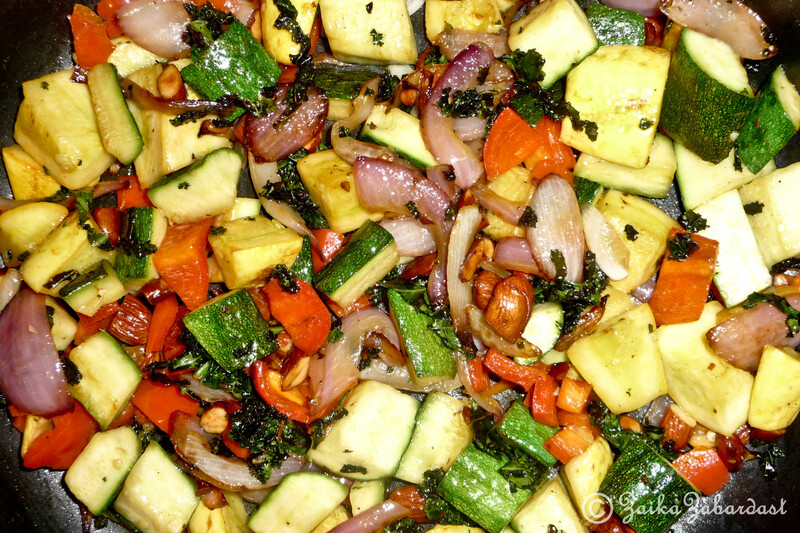 While your quinoa is cooking, you can sauté vegetables on the side. This way both the things will be done under 30 minutes. When oil is hot, add chopped almonds. Saute for a minute, let it get slightly roasted. This way you do not need to roast them separately and the almond flavor will incorporate in oil. Now add sliced onions and chopped kale. Season with salt and pepper. Cover and cook for few more minutes and add other vegetables. Cook until vegetables are slightly soft, but not overcooked. Cooking all these normally takes less than 10 minutes. 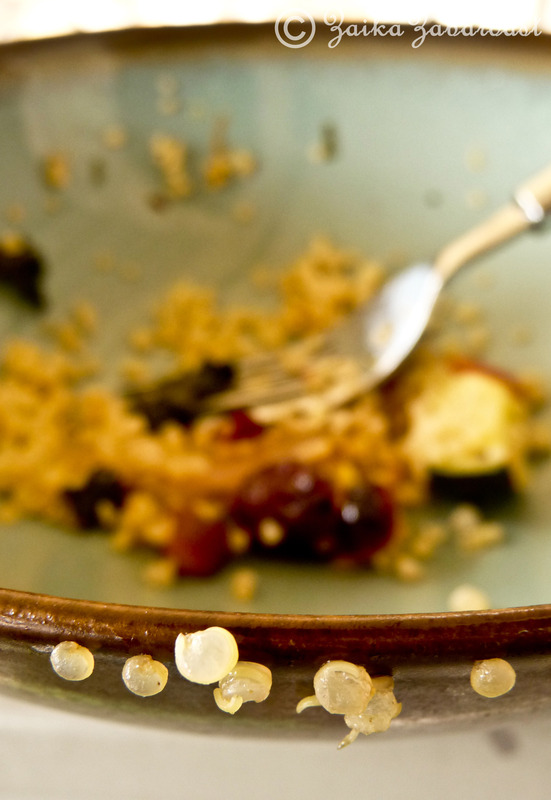 Sprinkle crushed red pepper and handful of cranberries along with cooked and fluffed quinoa. Drizzle a tablespoon of EVOO and fresh lemon juice. Mix everything well and let it cook for another minute or two. Make sure it is properly seasoned before you serve it. Serve hot or cold, it is best any way. Question: Have you ever tried quinoa? Do you like it or love it or not a fan of it? Why? 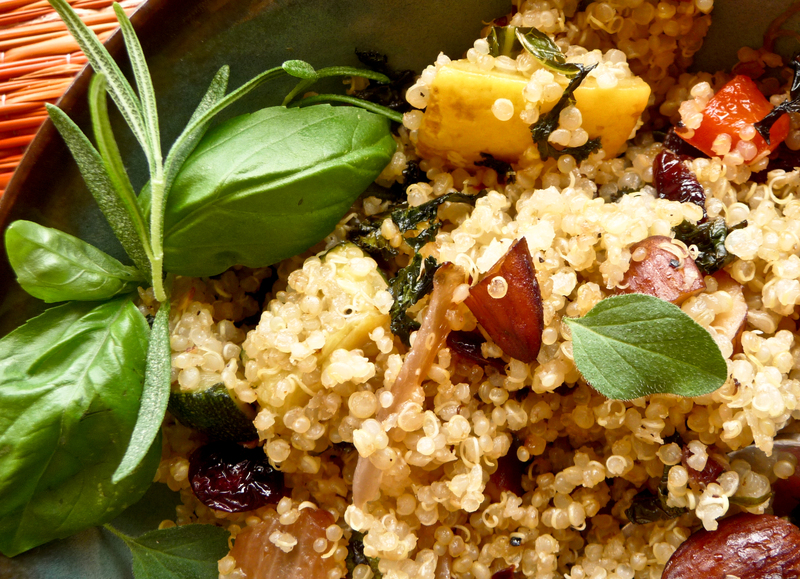 If you have your favorite recipe of quinoa, please share. I would love to try it. ← My Edible garden n Simple caprese salad! Last time I made quinoa, it didn’t come out perfect. I am still learning to make this grain and this recipe sounds like a great start. The second last photo is brilliant! I’ve even served it to the kids for breakfast with either raisins, cranberries or blueberries mixed in with a little honey or agave nectar and almonds or pecans. My youngest (just turned 3) hasnt taken to the quinoa as fast as the rest of us, he still loves his couscous more, but he will eat it some of the time.